1) (SOLD) Maple, White Marine Pearl with WMP inlay on the hoops. 45 degree edges. 2) (SOLD) Cherry, double inlay, with hoop inlay, 30 degree edges. 3) (SOLD) Ash, double inlay, with hoop inlay, BB edge top, 45 edge bottom. 4) (SOLD) Maple, double inlay, with hoop inlay, BB edge top, 45 edge bottom. 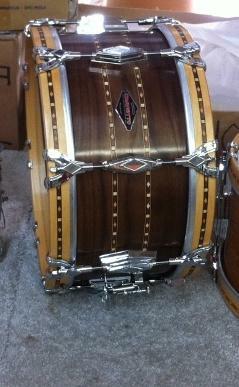 6) (SOLD) Stacked Solid walnut/curly maple/walnut, with hoop inlay and 45 edges.